Our Aluminium Labels are the metal in Metal Signs! 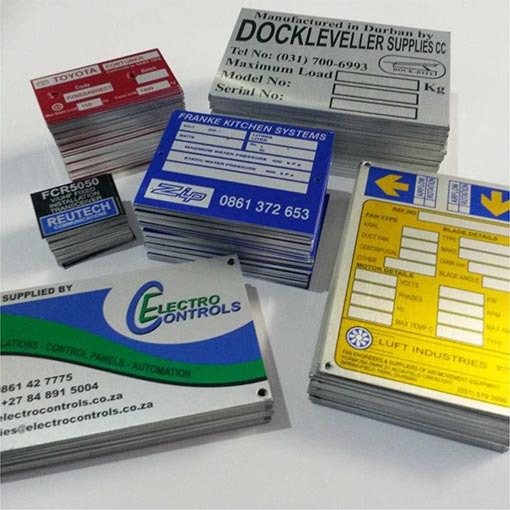 We are one of the few companies in Durban that print onto anodised aluminium. ANODISING : This process makes the top layer of the aluminium porous. After it is screen printed the metal is sealed, locking the ink in, making it safe from the environment – including being scratched. THICKNESS & MOUNTING : The most common used is 0.5mm thick which will be efficient for most jobs such as asset tags, although thicker aluminium is available (0.7 / 0.9 / 1.5mm). Holes can be punched for pop rivets, or a self adhesive backing applied. COLOURS : There is a standard palette of basic colours used, although others can be mixed, such as pink, aquamarine or grey. The only limitation is an opaque white. Another solution can usually be tailored to overcome this although most clients prefer to keep the silver sheen of the base metal as their white component. SIZE : Dimensions are for now limited to a maximum of 400mm due to the anodising tanks, although it is not common to need larger aluminium items – another material would then be selected. Aluminium discs are available in a few sizes – most commonly 40 mm diameter, but for large volumes a new die size can be considered if cost effective. Get in touch with us – we will provide you with a competitive quotation for the job you need done. Click the Request A Quotation button below and send us your enquiry. We aim to respond immediately we see your note.